Divine America: Will Blue "Help" You? To those of you following the Roots of Damnation series, please forgive my interrupting the thread; however, I did recently receive notification of something that required immediate attention. As lovers of liberty, I knew there'd be no better audience to help me get the message out there, that ENOUGH IS ENOUGH. It's unfortunate that I have to admit that it takes people being personally affected before they will do ANYTHING. Perhaps that's why this took precedence over the series. Because this time, the violation of liberty came too close to home. As a contributor to other sites, and a believer in the mission of unity across the nation, I often find myself working with teams of people. The people become like family - open to the ugly things about one another without the harsh criticism because some cosmic or blood-like bond shared. How would you feel if the members of your team or the extension of their ACTUAL family came under attack from the very things you speak against? The woman in the story happens to be a team member's cousin. Poetic isn't it? Now, that wasn't the only reason for my involvement in this case. Previously, the team and I put Henry County PD under the spotlight for pulling firearms on little boys for building tree houses. It seemed it was time to look deeper into the department. As a member of The Fight for Freedom Never Sleeps team, this was looking to be another mission for Operation Simple Request (OSR). Further research was conducted to determine the validity of the situation. Per the instructions of OSR, evidence was obtained that painted a clearer picture--not only of what's going on in Henry County, but the state of affairs across the nation. Listen closely to the calls for help Lori Knowles makes to the only people she KNOWS can be there in minutes to HELP her. Henry County Police Department identified the call of Lori Knowles as a "911 Hang Up - Unknown Trouble." After multiple failed attempts to communicate her request for help for a possible overdose of medication, the dispatcher assumes the problem and reason for the call. In less than an hour, Henry County Police Officers would forcefully enter the home of Lori Knowles, determine her as the threat, and open fire on the woman; ultimately leading to her death. I can clearly hear the woman beg for help in the first call, but let's see how her second attempt went. In this second call to police, Lori Knowles can again be clearly heard as she states her condition of being overdosed on a medication. This dispatcher attempts to calm Lori in order to discover the root of her call. In a defeated breath, Lori once again indicates a medical problem before being disconnected. I'm not going to tell you what to believe. No one can do that. But I will tell you this: the "HELP" for Lori, indicates the situation started at 4:11 pm. After a 15 minute ride to the hospital (20minutes for the average person, but we're assuming she had an ambulance), she was pronounced dead at 5:27pm. What this means is that people are liabilities. Police don't have time to spend more than an hour with you, before deciding, you're expendable. The dispatch certainly didn't aid by interrupting the woman - but I'm not the expert in communicating with overdose patients, so maybe that IS just the way it's done. But as if that were not enough, get ready for the real tear jerker. Listen as Mr. Knowles makes an attempt to COMMUNICATE with officers. Listen as dispatch prepares to handle the arrival of Lori's husband on the scene where his wife is attacked by officers. Listen as he begs dispatch to tell officers not to hurt his wife, all the while wondering if it's too late. Why does this matter to you? Like I said before, these are NO LONGER isolated incidents. These crimes against humanity, against the OATH TAKEN BY OFFICERS, has gone on far too long. There's a growing list of people who've been assaulted by "officers of the LAW" in the name of SERVICE and PROTECTION. There is something that can be done to bring misconduct like this to an end, but it starts with policing the police. We - THE CITIZENS of the state - can see to it that these officers be held accountable for their crimes in the same manner citizens are subjected; and we can see to it that justice be served to those who TRULY are servants to the people, and no more above the law than the citizens they claim to protect. You can shine a spotlight on this crime and many others like it, being perpetrated by the state's mafia, by checking out Operation Simple Request on Facebook. 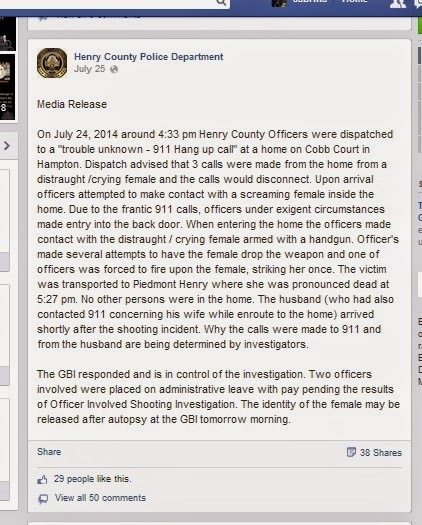 In the meantime, don't forget to let Henry County PD know what you think about their service and protection by leaving a review here. I wonder what the Dispatcher told the Police Officers? Did she relay Ken Knowles entire message to the police, or did she just say "be careful she has a gun"? I could clearly hear Lori state that she had overdosed on medication. I want to know why the dispatcher didn't hear what she was saying. This was shear negligence on the part of the dispatcher, and an overly forceful police unit. Protect and serve is not the same as break in and shoot before asking questions. Since Georgia passed the open carry law along with a stand your ground state there's potential to return to the Wild West days of settling disputes. Don't police depts. have negotiators or psychiatrist working with them anymore? I'm upset about this incident because Lori was a family member. We want answers. Justice will be served for my cousin... RIP sweet lady, you will forever be MY motivation to keep pushing forward and change bad laws! Tragedy for all involved. You can arm chair quarterback this incident all day. 1)How did a person with the potential to become mentally unstable gain access to a firearm. 2)99% of the time when a suicidal subject is armed and barricaded. Police will not enter until all others means have failed. Information might have been relayed too late about the firearm. 3) Less lethal should have been brought in with responding officers. Taser does not count in this incident because it would have made her contact and fire the gun any way. 4)Let me dispatch you to a call where all you know is "911 call-unknown problem. Female screaming." For all you know, your there to stop some sort of violence against a female. You go in due to exigent circumstances and are meet by a woman holding a gun. She fails to follow orders to drop the gun. Are you going to wait for her to shoot at you first. This aint the movies folks where we stare down the barrels of our guns at one another and talk it out. Generally speaking your safe until you raise your arm to aim the weapon. This whole incident needs to reviewed as to who knew what when before crucifying an officer for defending his life. RIP Lori and may God comfort all who are involved. I agree this whole incident is sad, and the fact that someone, Lori, lost her life is a tragedy. I will agree, for all of you crucifying the police officer and dispatchers, you have NO idea what it is like on the other end of the phone, radio, etc. It can be quite stressful, very hectic and down right emotionally exhausting. I a 911 dispatcher have gone home MANY nights crying/caring for calls I have taken during my day. I am agreeing that you can hear Lori asking for help, however in this type of call, a ambulance will go, but PD will go as well and will make contact before EMS will ever enter due to them being unarmed. Listening to Mr Knowles calling, I also hear that he asks that PD not enter (PLEASE) because...she has a pistol....and he does not know what she may do. That does tell you that he knew something would happen/that she may not comply with them. 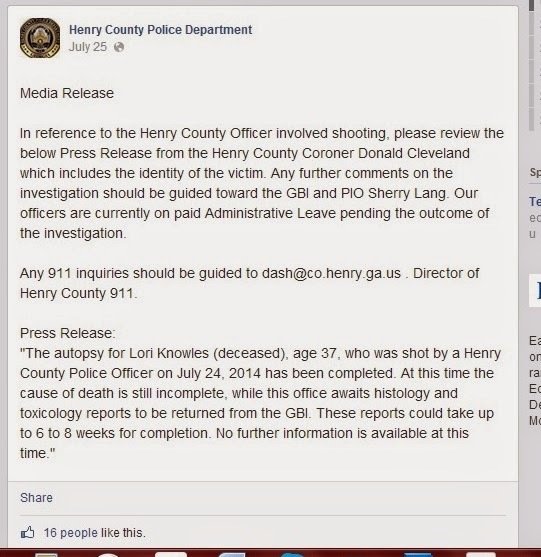 I do also think that HCPD needs to do a follow up news conference to let the public know that the shot fired was not what killed Mrs Knowles, as that poor officer was ridiculed so harshly on social media. Police have families too, and most people do not understand that, they want to go home to their wives and children at the end of their shifts too. Not every person they come in contact with every day are perfect law abiding citizens. Let me answer a couple, very particular questions for you all, if I may. As investigations have shown, excited delirium was the cause of her death. I might add that she in fact DID have a pistol, on her right hip the whole time. There have been three versions of this story to surface, since it happened. 1.) The first story that came out was that she made an aggressive, offensive movement towards the gun. 2.) She pointed the weapon at the officer once he went into her bedroom, where she was standing at the foot of her bed. 3.) The final account, which turns out to be the official story, she never touched her weapon and it was still in the holster when he fired upon her. The fact remains, it was less that two mins from the moment he entered their home, until the moment the cop came across the radio stating "Shots fired." As a former LEO, I can tell you right now, escalation of force was NOT followed in this case. As more information is being released about it, everyone here needs to remember the 5 rules regarding EOF. As "civilians" we hold our LEO's to a higher standard. This is why law has put them down to go through a prolonged training course, formally called Mandate School. We elect our sheriff's to oversee that his/her officers have the most up to date, modern training there is. That does NOT mean that they are to approach, what someone up top called "potential suicide," with a "shoot first mentality. Each department has specific individuals to deal with these kind of situations, which is why you will see a certification logo on their patrol vehicles. Moral of this story that I am writing here: How many times have you seen, on a basic search of YouTube and you will see that there are cases MUCH worse than this and MUCH more violent in nature and the officers take a TOTALLY different approach to the situation. Solution, you DON'T show up to someone's home, with the mindset that "I'm going to go home, to hell with someone's safety." If you're that scared of your position, as a public servant, you might want to consider a job that doesn't involve putting yourself in the line of fire. Putting "officer safety" above the Constitutional Rights of an American citizen, is asinine. As I used to ALWAYS tell my fellow deputies, "Make it safe." Each and every officer has a choice to make, when it comes to their safety, they can "be safe" or they can "Make it safe." I feel so sad for Ken Knowles. How heartbreaking. These type of outcomes are preventable. I could clearly hear what she was telling the dispatcher as well.